ok, i know that canadian thanksgiving comes early but it still kicks off the “holiday season” in my mind, and it feels waaaay too early for that this year. maybe it’s because our summer was long and hot, and that it’s 23 degrees outside today. the fall harvest has helped me get in the mood for a thanksgiving feast, and james and i are hosting a few family members at our place on monday. 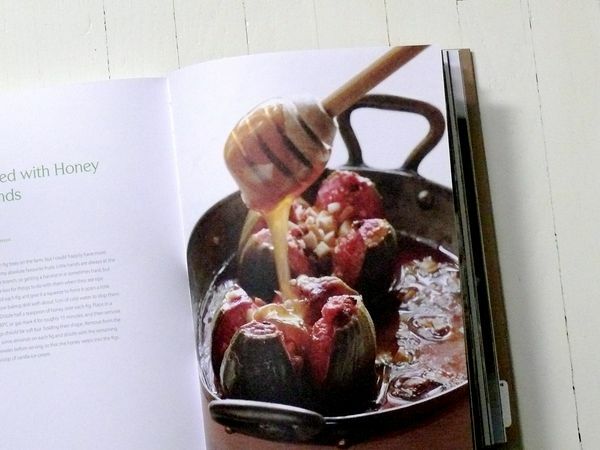 and speaking of harvest, i found a recipe that even i can attempt in a book by the same name. figs sprinkled with honey and nuts, then baked. i can do that! no flour, kneading or other scary baking words in the recipe at all. that and some vanilla ice cream is what i might be serving for thanksgiving dessert, unless my mom or aunt comes to the rescue with something a little more exciting to cap off dinner. something that didn’t practically make itself. if you have any dessert ideas for a non-baker like me, please let me know. i’ll be back over the weekend with an update on how the prep is going and my thanksgiving menu. i’d really love to hear about your menu too. until then, enjoy your weekend (and the weather! ), everyone.